A perfect way to send holiday cheer. 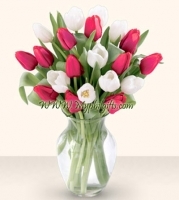 This 15 stem bouquet of red and white tulips is the perfect gift to send as a holiday greeting. They arrive ready for the recipient to arrange in their own vase, or you can choose to include a glass vase with the arrangement.